Frank Ortiz is, in fact, from San Felipe Pueblo. But San Felipe does not really have a jewelry making tradition, so most of its jewelers have learned the craft through intermarriage or friendship with residents of Santo Domingo Pueblo. San Felipe Pueblo jewelry, therefore, is almost always made in the style of Santo Domingo Pueblo jewelry and such is the case with the work of Frank Ortiz. 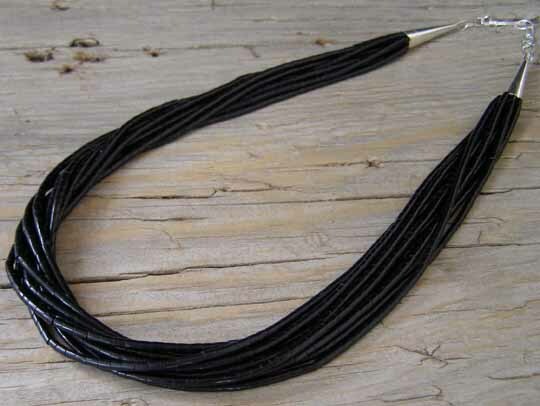 This ten-strand fine heishi necklace of jet is made in choker length. The strands are finished with Sterling cones. A one-inch extension chain allows further adjustment of the length from 18 1/2" to 19 1/2" in length.